A mining operation in Cerrejon, Northern Colombia, opened a window onto a previously unknown period of the earth’s history and a world teeming with giant creatures emerged. The biggest of all was Titanoboa a 43-foot snake, the largest that ever lived. But new discoveries in Cerrejon suggest that Titanoboa’s rule was challenged by a giant crocodilian. Follow scientists as they try to comprehend the size of this animal and uncover what made it so successful. Close analysis of fossils and scientific experiments reveal unmatched hunting prowess. So which one was the apex predator in Cerrejon 58 million years ago? © 2016 THIRTEEN PRODUCTIONS LLC. ALL RIGHTS RESERVED. 65 million years ago… a giant meteor struck the earth… Global temperatures plunged and a mass extinction wiped out the dinosaurs and changed life on earth forever. Little was known about the world that emerged after the catastrophe. Male It's a cute little skull. …has opened a window onto the creatures that sprang up to take the place of the dinosaurs. Jonathan Bloch Oh man, look at that. Jonathan Bloch Now of the preservation is amazing. …has revealed creatures familiar to us, but colossal in size. Gregory Erickson This animal essentially became dinosaur sized. Giant crocodiles and enormous snakes, living side by side. Gregory Erickson So they were probably growing at about a foot and a half a year, and they just kept cooking. What were their strengths and weaknesses? David Penning It was a very, very fast maneuver is on the order of an eye blink. Gregory Erickson It's going to hit it. Oh my gosh! Wow! Jason Head There have been these giant snakes praying on everything all over the place. …to discover the strongest predator in this land filled with giants. Paul Sereno They themselves are the only things that they fear. The gigantic meteorite that crashed into earth caused a global catastrophe. Known as the KT Extinction event, it destroyed an estimated three quarters of all living species. Entire ecosystems collapsed and the mighty dinosaurs became extinct. The land of giants was over… or so it was thought. The plant and animal species that survived this post-apocalyptic world were a total mystery… until now. Today in Colombia, South America, the Cerrejón Mining Company operates one of the largest coal mines in the world. They have trucks the size of two-story houses carrying coal cut from deep within the earth's crust. But with each layer they claw away, the company edges their way further back in time. In 2003, they reached the critical layers that were laid down more than 10 million years after the extinction of the dinosaurs. What they found was stunning. Paleontologist, professor Jonathan Bloch, rushed his research team to Colombia. Jon has spent his career studying this period in the earth's geological history; it's known as the paleocene. He realized this could be the lost world he'd been searching for. Florida Museum of Natural History	When you open that door into the world 58 million years ago where no one else has looked, you find things that no one else has found. So every time we come to Cerrejón is very exciting because after coming for well over a decade, every time we come we find something new. (SOT) Oh man, look at that! Pretty cool. The scale is incredible; I mean there's so much exposure of rock here. Hundreds of fossilized leaves were scattered in the layer, indicating the land during this time was dramatically different from the cretaceous world of the dinosaurs. Jonathan Bloch (SOT) You see that? There's a leaf right here. We see the first evidence of Avocado and Ginger and chocolate and beans. You can see enough to… to see that this is part of a forest that's… that's very warm, the size of the leaves that we find in these layer tells us it's also very wet. So this is consistent with a tropical forest. (SOT) This is the stuff I was talking about and it's up there too. The impact of the meteor gave rise to an entirely new type of rainforest. Jon and his team wondered what animals might have lived in this swampy, humid environment. Jonathan Bloch We came here to look for fossil animals, but when you're going to a place where no one has found fossils before and you know you're taking kind of a gamble, it can be weeks before you find anything, if you find anything. But within maybe 10 or 15 minutes we found the first bones at Cerrejón. (SOT) Man, I wanna check this out. Male	(SOT) Ah, I dunno. What's that? What they found was beyond anything they could have imagined. Jonathan Bloch	Oh that's really cool. Jonathan Bloch	(SOT) You see that? Their size. This was a land of giants. Jonathan Bloch We're lucky to have found this. This is… this is a big turtle. Carbonemys Cofrinii was the largest fresh water turtle of its time. Today, fresh water turtles rarely exceed two feet in length, but this enormous creature was the size of a family car with a skull as large as a football. More intriguing were the signs that this giant may have been small prey to a much larger predator. Jonathan Bloch The shell of Carbonemys shows us many things about its size, and another really interesting feature are these puncture marks, you can see them here, there and throughout the shell. From these puncture marks we can see that the turtle was probably bitten many times throughout its life. The fact that we can see so many bite marks on the carapace might tell us one of the reasons why these side-necked turtles would have had so much thicker shells than what we see today. These puncture marks indicate something much larger was lurking in the swamps, with a bite so powerful it could pierce a thick armored shell. The scientists quickly found evidence of the species responsible for the attacks. Jonathan Bloch	(SOT) Oh-ho! What is this? Jonathan Bloch (SOT) It's a cute little skull. Ah yeah look at that. Jonathan Bloch We didn't know what they were at first. It became pretty clear after a day of collecting that we had fossil crocodile relatives. Jonathan Bloch (SOT) What you're looking at here are the two eyes and then two holes on the top of the skull. Male	(SOT) It didn't make it to maturity. The mine was crawling with ancient crocodiles. Each piece of fossilized bone was carefully packed and shipped back to Jon's lab in Florida. There, Dr. Alex Hastings, a member of Jon's team, was racing to catalog all the finds as they poured into the lab from Colombia. Virginia Museum of Natural History	In the beginning, dozens and dozens, and then hundreds more of these fossils were coming in and getting a chance to unwrap these things and kind of start piecing everything together was great. The team found different crocodilian species, including the culprit responsible for attacking the turtles. Alex Hastings This is the short-snouted one, or the "turtle chomper." Several large turtle shells from the Cerrejón site that have marks that fit very well with the teeth of this individual crocodile. But the largest croc they found was a species called Acherontisuchus. It was no bigger than today's crocs – a surprise given how large the snakes and turtles were. Alex Hastings Acherontisuchus could have gotten to somewhere between 15 and 21 feet. Now this is really on the upper bound of crocodilians today. Given the extent of the wounds found on the giant turtle, there was the suspicion that somewhere in the Cerrejón mine there lurked an even larger predator. Crocodiles are as old as the dinosaurs. The first evolved around 200 million years ago, at the start of the Jurassic era and 145 million years before the period Jon studies. The largest crocodile that ever lived was called Sarcosuchus. Up to 40 feet in length, this eight-ton monster held its own in the age of the dinosaurs. So far, Cerrejón seemed to suggest that crocodiles of this size died out with Tyrannosaurus Rex. Jon's team soon found another colossal bone. But was it from a crocodile… Or some other giant monster? Jonathan Bloch So there were so many bones to pick up that we didn't always identify everything properly, that we collected. Picking up a bone and I remember talking to a student about it at that time, and we looked at it and we weren't exactly sure what it was. So I wrapped it up in our paper and tape and put a field number on it and wrote, "Crocodile, question mark." Alex Hastings Late at night I was just kind of unravelling these things. Most of them were crocodilians but there were a handful of bones there that were clearly not any crocodilian. The whole structure of the vertebrae was completely different. Alex and a fellow student recognized that although it was the size of a crocodile vertebrae, it actually belonged to a snake. Alex Hastings Not only you know a really big snake but being bigger than any snake we knew of, and we immediately started pulling out skeletons of anacondas and pythons and finding anything we could about giant snakes and every single thing we were finding was smaller than what we were looking at. Anacondas are the largest snakes alive today, but their vertebrae are dwarfed when placed next to that of the Cerrejón monster. Jonathan Bloch We realized that the bones that we had in our hands were much larger than anything that had ever been described before. In fact, so much larger that I had all kinds of wild ideas right away about how large that snake would have been, and so that's when I contacted the world's expert in calculating body size in the largest fossil snakes. That scientist was Dr. Jason Head, and what he was about to see would redefine the concept of the giant snake. Museum of Zoology, University of Cambridge	Jon video chatted me one day and said 'Erm I have a giant snake, you have to see this, it's amazing' and I said, 'You know, I've seen snakes that are supposed to be giant snakes and they never turn out to be as big as you say they're going to be. So sure, you know, show me the snake.' And then he came back holding a giant vertebra and he put it right up on the camera and at that point I got very excited and I bought a plane ticket and went down there. Jason Head	This animal is going to reset everything we know about what it truly means to be a giant snake. The sheer size of the snake was hard to comprehend. Jason Head We started to get body size estimates that were really astounding. I was really worried that we were doing the math wrong and so we went back and we did the math over and over and over again and every time it kept giving us the same massive length. So after a while I simply had to accept the fact that this animal was almost 50 feet long. Weighing more than a ton, this giant snake was five times bigger than the largest alive today. They named this new python, Titanoboa. When they published their findings in 2009, the discovery of the snake made headlines around the world. Little did they know that there was another monster lurking out there waiting to be discovered. Fossils in the coal mines of Cerrejón reveal that giant aquatic reptiles filled the ecological void left by the dinosaurs. What was it about these creatures that allowed them to thrive? In the extreme winter that followed the meteor impact, global temperatures plummeted. Turtles, snakes, and crocodiles were able to scavenge and gorge on the dead carcasses and then go for months without food. Being cold blooded gave them an advantage, allowing them to sit out the disaster. Eventually, nature found a way to restore its delicate balance into a world that was very different from the one their ancestors had left behind. Jonathan Bloch It took a while for that ecosystem to recover from that extinction event and what we see here in this forest is similar in some ways to what we find in Cerrejón. And as temperatures rose again, a 43-foot-long snake dominated the swampy world. Jason Head They probably almost never left the water, I think this animal would have had a hard time breathing on land. Just hanging around on the bottom for the most part, waiting for food. I think it would be very hard to have killed Titanoboa. Snakes are not easy to kill actually in general, they're pretty rugged animals, they're pretty tough, and when they're 43 feet long, they're probably extremely hard to kill. Our hypothesis going forward about the ecology of Cerrejón is that Titanoboa is the apex predator. For years, scientists believed Titanaboa was the apex predator of the Cerrejón swamp – until Jonathan Bloch called on one of his top graduate students for help. Aldo Rincon's expert eye scanned the mine for more huge bones and it wasn't long before he found one. It wasn't a snake bone, but it was large enough to have existed during the era of the dinosaurs. Aldo Rincon	(SOT) Now we need to try to get it out of these channels, they're up to by Jason. Jonathan Bloch	(SOT) Yeah you're right, it definitely starts looking better over here. Aldo Rincon	My first guess was maybe it looks like a dinosaur. Jonathan Bloch (SOT) Yeah and maybe in some of these channels or something, we might stand a chance. University of Florida	But we knew that there were no dinosaurs in here. So, I mean I was pretty excited, but at the same time it was pretty confusing. Could it be that Aldo had unearthed the beast responsible for attacking the giant turtles? In Florida, Alex Hastings got a look at the newly discovered bone and immediately realized it belonged to a crocodile – and could rewrite history. Alex Hastings And it's just amazing to kind of unravel this thing and have something that you know is way, way larger than anything else. But it's frustrating because there's just this kind of tantalizing clue that there is this massive, massive crocodilian there. So, we know at least… at least one of these guys got to be really, really big. Alex suspected this bone was evidence that giant crocodiles were not destroyed by the KT event, but survived into the new era. First, he needed to know more about this bone: Where precisely did it fit into the crocodile skeleton? And did it belong to an adult or a juvenile? To find out, he headed to the University of Chicago, home to America's only fossils of Sarcosuchus, the pre-historic crocodile from the dinosaur era still believed to be the largest to have existed. The university is also home to Paul Sereno, a leading expert on these prehistoric giants. University of Chicago	Sarcosuchus is the best known of the giant crocodilians. In terms of feet we're talking about 40 feet long. Seeing the fossil for the first time, Professor Sereno realized the Cerrejón croc could be on a scale to match the Sarcosuchus. Alex Hastings	(SOT) Yeah it definitely extends quite a bit longer. (SOT) I've got a 12-foot alligator upstairs; it looks tiny compared to this. Alex Hastings	(SOT) Awesome, yeah. Paul Sereno	This giant crocodile is really fantastic, it's a window onto a time that we have very little information about. So this is really a great interest that there might be a lineage that also survived the KT boundary that we don't know about. Alex Hastings (SOT) This is from a dorsal series, I'm thinking just kind of a little back behind the neck, somewhere in the rib cage area. Paul Sereno	The vertebra from Columbia is a… is a large croc, how large? I think we need to determine. Paul Sereno	(SOT) We'll take this to the scanner and it'll be interesting to compare it. The first step was to scan the partial bone to get an accurate picture of the precise shape of the original vertebra. The vertebrae vary in size and shape. By making a direct comparison with bones from a similar position in the spine, they can predict the precise size of the Cerrejón crocodile. Alex Hastings The reason we're doing this is to help us understand better where in the vertebral column, where in the backbone, of this one fossil from Colombia fits in. So it's important to have something that's very large to compare it to, to get a more accurate idea of how big the fossil was. The scan also allowed them to see inside the bone, where the internal structure and density would tell them the age of the creature… whether it belonged to a small juvenile or a fully-grown adult. Paul Sereno	(SOT) Great, well let's get these scanned. Virginia Museum of Natural History	Seeing Paul's reaction to it, knowing that he's already very familiar with Sarcosuchus, is kind of confirming that we know we're definitely in that really, really big croc territory. The early signs suggest this could be a new giant croc species. What allowed these creatures to grow to such a gargantuan size? Scientists found a clue not in animal fossils but in those left by plants. Jason Head This leaf here is what's called a smoother complete margin leaf, it's got a very continuous outer margin to the shape, and this is a serrated or jagged margin too, there is that serrations almost like a knife. Most of the fossil leaves in Cerrejón were smooth-edged, allowing them to retain moisture in a hot environment. The leaves confirmed Jason's suspicions that Cerrejón was around four degrees hotter than rainforests today. Museum of Zoology, University of Cambridge	It would have been constantly raining and very wet, incredibly hot and humid all the time. Cold-blooded animals like snakes rely on external factors to set their body temperature; in warm environments, they're able to expend more energy. In the heat of the swamps, Titanoboa would have been hunting and eating its way to its gigantic size. But what about the ancient crocs? Dr. Greg Erickson is one of the world's leading experts in crocodilians. This aggressive alligator was culled to protect the public, but beneath its skin lays a clue to its ancestor's great size. Gregory Erickson	So this is essentially a very armored animal, but there's more to these osteoderms than meets the eye. What you would see if we cleaned the skin off of this is something like this, and this is an osteoderm. The hard, bony osteoderms protect the crocodile's vulnerable back, but they also contain hidden information about the growth rate of the animal. Florida State University	These animals lay down annual growth lines in their bones and the osteoderms preserve them. It's very much like the growth rings in a tree. In the case of giant crocodilians, it's possible to figure out how they became giants. Dr. Erickson carefully slices off a tiny sliver from the alligator's osteoderm. Gregory Erickson Voila! Let's see how we did. Well we've got our osteoderm under a microscope and lo and behold we can see the annual growth lines. This last growth line was the one that was laid down just before it died. Its younger growth lines are back here and they're much broader and we would expect that, that's when an animals young, it's essentially its teenage years and growing like crazy. There's 15, maybe even 20, I can see right there. These animals usually mature between 12 and 15 years of age, and these are plateauing their growth and we can see how the growth lines start getting tighter and tighter towards the periphery. So its growth was slowing at that point. This mature alligator has 15 growth rings, one for each year before it reached adulthood. However, when Greg compares this to an osteoderm from the giant croc, Sarcosuchus, there is a striking difference. Gregory Erickson	The difference is this osteoderm has 55 to 60 of these growth bands packed in there. So, this animal essentially became dinosaur sized – instead of plateauing at say 20 years, as you may see in American alligator, these animals plateaued their growth at maybe 40, 45 years of age and so they were probably growing at about a foot and a half a year and they just kept cooking. So the secret to crocodilian giantism is simply prolonging the timing to maturity. So it's likely that the Cerrejón croc was also able to delay its maturity, allowing it to grow to a fearsome size – but exactly how big? Paul Sereno	(SOT) Do you wanna run those vertebrae through first? Alex Hastings	(SOT) Alright, let's do this. The scan will generate three-dimensional images and allow the scientists to see inside these giant relics for the very first time. (SOT) It looks like a great scan. Alex Hastings	(SOT) Yeah. It's gonna be beautiful when it's done. It's good. Ah, that's cool. Paul Sereno	(SOT) You've got the form of… and the internal structure of the bone now. So you can make a comparison. The shape will confirm where the bone sat in the croc's spine, and the density will help determine whether it's a fully grown adult or just a juvenile with a lot of growing still to do. Alex Hastings (SOT) So much detail! Alex Hastings (SOT) It's gonna be fantastic to go through. And it could be a preservation thing in the Cerrejón ones… May have just been infilled with sediment in the fossilization process. Alex Hastings Great to see the CT scan, the surfaces look fantastic. There will be a lot of numbers to crunch to really get the answer for how big exactly it was. (SOT) Yeah let's see… let's go through that, the one, the Cerrejón specimen. A unique environment filled with reptiles of an astonishing scale, and one where a giant crocodile and colossal snake both inhabit the same ecosystem. All the evidence indicates that whenever snakes and crocodiles hunt in the same quarters, it ends in conflict. The indigenous American alligator, and the invasive Burmese python. Research ecologist Kristen Hart is charged with capturing the disruptive pest using a GPS and radio tracking system. Kristen Hart We know for a fact these Burmese pythons came here because of the pet trade, they were nice pets for people then they got really big, really fast and they were too much to handle so instead of putting your pet down, they may have come and released it in a nice environment like the Everglades. (SOT) We're very close to the animal. So the python is a damaging critter for the Everglades because it does compete with the alligator as a top consumer in the food chain. In these ideal conditions, the snake population has exploded, leading to a shortage of food, and violent clashes. Kristen's radio transmitters uncovered evidence that the two predators are turning on each other. US Geological Survey	We were tracking one of our radio-type pythons and the signal was clearly in the alligator cause as the alligator started to move away from us, the signal got weaker and weaker as the alligator got further away. So we know from that instance that the alligator actually consumed the python. We have definite evidence from stomach content analysis that pythons do consume alligators. I don't know of too many other places where you have crocodilians and large constrictors consuming each other. Today, sightings of hungry pythons taking on much larger alligators are not uncommon. This battle between a large Burmese python and a juvenile alligator was captured on video. It took the python more than three hours to constrict and eat the alligator. And this fossil reveals the same battle raged millions of years ago. It's hard to see, but nestling in the stomach of this fossil snake is a baby crocodile. It is clear that in the murky swamps of the Cerrejón, the giant snake and the mega croc would inevitably have come into conflict – but which one would triumph? By looking at their living relatives, we can piece together how these two killers use the impressive array of weapons. Snake expert David Penning demonstrates one of the snake's formidable tools, the thermal equivalent of vision. University of Louisiana at Lafayette	So a snake has a whole other world that it sees than what we do. So not only can they see something visually, they can also pick up the heat signature of it. This super-sense allows some snakes to see their prey literally in a different light. David is going to demonstrate how. David Penning So today we're gonna try a thermal experiment. Many boas and pythons have external pits and nerve endings in their head that allows them to actually perceive infrared or thermal energy. So we're going to use a snake that has pits. I'm actually gonna cover her so that she doesn't feel like exploring. So what we have here are two different gloves with two different temperatures. This is a glove filled with hot water, and this is a glove filled with cold water. So we can't see the difference. She can, she has an infrared sensing system that can differentiate between temperatures. So this snake will be presented with two gloves that look alike and are moving similarly, but are very different in temperature. It's in a low light situation so snakes are more likely to be relying on their infrared sensing capacities to make a choice between which object to strike at. We don't have this system, she does. She's gonna be perceiving infrared energy, we can't. The chances are it'll make a decision for the hot glove. And there she goes. When offered these two gloves she's orientating towards and striking at the warm one. Using its heat sensors, the snake can detect its prey without even seeing it. Then, it's only a matter of seconds before it launches a deadly strike. David Penning So in many boas and pythons they have heat sensing pits in their labial scales around their lips and, what those are, are extensions of the trigeminal nerve. The nerve actually comes out and is in the base of those pits. So those are free nerve endings that interpret infrared heat. They're constantly – you can think of almost like a Geiger-counter –they're constantly ticking. So the snake is experiencing a nerve impulse about 13 to 30 times a second the snake… the nerves are firing but when an infrared image or a hot object is put in front of it, it starts to increase. And so it sends a signal back to the brain that allows them to see a thermal image of their prey. And just like boas today, Titanoboa would have used the same capabilities to hunt. This super sense made it an expert at ambushing prey. But the croc is equipped with its own unique tracking device. Dr. Erickson understands what makes these carnivorous beings so skilled at pursuing their quarry. Gregory Erickson The architecture of a crocodilian head is just amazing, how sophisticated this is. It's just a remarkable killing machine. These killing machines have an incredible tool: dome pressure sensors, thousands of tiny dots sprinkled around the mouth that act as built-in radar, directing the beast toward its target. Gregory Erickson	Say there was an animal splashing in the water over there, the pressure waves in the water would hit the face of this animal, it would go down through the dome pressure sensors and basically register with the brain that, 'Hey, there's something going on over here,' and this animal would make its way over there. So it's a really remarkable sensing device. These sensors allow the crocodile to sit stealthily beneath the water's surface before attacking its unsuspecting prey. Gregory Erickson Dome pressure sensors are features found only in crocodilians. The architecture of those structures are completely unique to the animal kingdom. These animals have a sensory standpoint; they've got it all. Back in Louisiana, David Penning is trying to measure something that has never been measured before. He's going to calculate the strike speed of Titanoboa. David Penning We don't have a snake alive today the size of Titanoboa. What we do have are snakes of different sizes alive today. We estimate what Titanoboa can do based on what living snakes today can do. Snakes are incredibly difficult to see in the wild. They move slowly toward their prey, getting as close as possible before striking. When they do, as David demonstrates with a dead mouse, it's with ferocious speed. David Penning The strike that we just saw here by this red-tailed boa was probably on the order of 50 to 100 milliseconds. So this snake starts his strike and comes in contact with the prey before the prey even has the ability to send a signal saying something might be a threat. Many snakes have the ability to reach their target before their target is even aware of the fact that something just happened. Like its modern descendants, Titanoboa was a constrictor and it would have used the same tactics to surprise its prey. David Penning It was likely striking at prey from only about a half a meter away and that's because it's waiting for prey to get close – and half a meter is a considerable distance, but not when you're something the size of Titanoboa. Having amassed a comprehensive data set of size versus speed, David is now able to speculate how fast Titanoboa could strike its prey. David Penning Point one to point two seconds. Point two seconds is on the order of an eye blink. So this is still a very, very fast maneuver. These values are within the range of what we would expect from smaller snakes but that actually makes it more impressive considering the size of what this animal had to move towards a prey item. Titanoboa accelerated on average 150 meters per second squared during their strikes. Human's pass out at about 50 meters per second squared. This incredible speed exerts a force 15 times greater than gravity. If the human body accelerated at this speed, we would almost certainly suffer brain damage. David Penning So we're talking about impact pressures similar to what we see in impacts with bullets shot. The strike speed of this giant snake is truly terrifying, but the giant crocodile was hardly slow. The secret behind the crocodile's attack speed was its muscular tail that propelled it towards its prey. Florida State University	Crocodilians swim sinuously, moving their tail back and forth, but if they need burst speed they can do it very powerfully. This massive tail is the secret to the incredible acceleration these animals can do… this is what creates the propulsion. You know some of them can leap out of the water, most crocodilians can seize prey within about two-thirds of their total body length. So the bigger the crocodile, the more powerful its acceleration – up to 40 feet per second, or its full body length in the blink of an eye. But stealth is just the beginning. Once the prey is caught, the two predators use very different techniques to kill. The crocodile's greatest weapon is its powerful jaws. How can bite force be estimated for an animal that lived 58 million years ago? One of Dr. Erickson's ongoing studies is the relationship between a crocodile's size and the power of its bite. He carries out his research at an alligator sanctuary in Alabama. Here, well-fed gators are used to interacting with people. Male Keeper	(SOT) Let's start with him. I'll think he's give us a good bite. Gregory Erickson Crocodilians have been the guardians of the water land interface for 85 million years and the secrets to their success, or a lot of it, comes from their feeding abilities. Gregory Erickson	(SOT) Yeah we're gonna need… boy, six or seven people (laughs). It's routine procedure for these gators, yet still extraordinarily dangerous for the team. Male Keeper	(SOT) Ready to make it happen? Gregory Erickson	It's gonna take quite a few… a small army of handlers to get that animal over to here so we can test it. So, we'll see how it goes. Male Keeper	(SOT) Lemme get the rope on him, see what kind of mood he's in. Gregory Erickson	(SOT) You got any smaller ones? (SOT) We wanna get this strap right at the back of the head and try to get the head pinned down and then of course do the rest of them. Male Keeper	(SOT) Hey. Come here. Up here, up here, up here. Come on! All right, doc, pull it. You got him? Oh, and we're there. All right. Male Keeper	(SOT) Got the rope, got the rope? Give me some slack, give me some slack, thank you. Gregory Erickson	(SOT) Right, let him back up a little bit, then we'll do it again. All right. You ready? All right. Two, three. All right, let's get round. We're good on the head. Male Keeper (SOT) You've gotta flip. But even experienced gator handlers can be caught off guard by sheer brute strength. Gregory Erickson	(SOT) The last one to go is this one… Whoa, you OK there? Male Keeper	(SOT) Yep I'm good. She caught me off balance. Gregory Erickson	What I'll do is I'll insert this flat plate into the mouth of the alligator. As soon as this plate touches the teeth, the animal is gonna slam it, it elicits a very, very forceful bite. As that plate's compressed, it's gonna give us an electrical read out that tells us how much force was involved during that particular bite. Gregory Erickson	What these animals do is they, they sink their teeth into the hide of large game and get a purchase on it. Then they work the animal out into the water and use their great mass and just submerge the animal and drown them. If that animal starts struggling and it's getting out of the jaws, they'll reassert their bite again. The real secret's right there, those muscles tear wide muscles and you'll see those contract. This is really the engine behind this creature, 60 percent of the bite force comes from right here. It's not… that's not the neck, that's actually jaw muscles that are billowing out of the back. I think this mimics prey that are struggling in their mouth, if they've got to reassert their bite, let's see if it bites again here. There is it. Nice clench. That's 1,544 pounds and that's without slamming the jaws, just from the dead start. It's like a high horsepower engine or something, boom. (laughs) It's gonna pop left now. Greg's study proves the power of a crocodile's bite is proportional to its size. Gregory Erickson (SOT) Wow. You really hammered it. Male Keeper	(SOT) He's has been as cooperative as he's gonna get. Gregory Erickson	This alligator is 11-foot-6 but (laughs) it felt like a 13-5, I'll tell you. It gave us a heck of a run. I'd liken this to being kind of like bull riding for scientists (laughs). Once Alex Hastings gives Greg an accurate size for the Cerrejón crocodile, he will then be able to estimate the power in the beast's bite. But Titanoboa was far from defenseless. As a constrictor, it was able to exert crushing force. Just how strong was our prehistoric giant? David Penning has spent years studying the constriction strength of snakes. Now he's going to apply the same expert analysis to estimate Titanoboa's crushing power. University of Louisiana at Lafayette	We are going to be testing 4-500 snakes to predict what Titanoboa could have done. That's the largest data set on constriction performance on the planet. By fixing sensors to the snake's meal of a dead rabbit, David will be able to measure how much pressure this comparatively small constrictor can exert. David Penning We are recording. 3PSI. 3.2… yeah she's dropping off a little bit. That pressure is in the range necessary to kill an prey item by circulatory arrest. 3.2 pounds per square inch is more than enough pressure to kill even larger animals. But how does that compare to the pressure Titanoboa could apply? David Penning She is probably 15 feet and 3 or 4 inches, so from that length, if we know that she's 15 feet and Titanoboa could get upwards into the 30 and 40-foot range, and she squeezes with a certain pressure, we know what smaller snakes and other snakes her size can squeeze, we can infer what Titanoboa could have done. Armed with the results of the constriction tests, David reveals the unparalleled power of the snake's gigantic ancestor. David Penning Titanoboa likely squeezed with a constriction pressure ranging from 50 to 250 pounds per square inch. That's 250 pounds of pressure exerted on every inch of contact with the prey's body. But when David estimates the total pressure, the potential force is truly terrifying. David Penning On the high end of the estimates we're looking at 1.3 million pounds of force. A tank weighs about 150,000 pounds and so we are almost an order of magnitude greater than the weight of a tank. That is just frankly not survivable. But David Penning's research has thrown up another surprise that casts light on precisely how Titanoboa killed its prey. It has long been believed that snakes constrict their prey until they suffocate – but David's latest data suggests the kill is far more efficient. By studying the internal damage to the prey, David has discovered that an entirely different phenomenon kills the animal. The force of constriction induces what's called a "red-out" – what animals experience when the brain is under a massive amount of physical pressure. David Penning We see these effects in prey. So not only is their heart having problems pumping blood, you now have approximately half or a third of your blood above that coil and pressure's being pushed here and fluid has to go somewhere. That somewhere is in your brain. Applying the equivalent pressure of several military tanks floods the animal's brain with blood. David Penning It's forcing blood towards the only exit, which are the eyes, the nose, and the mouth. So when something like a crocodile's being constricted they literally see red before passing out. The force exerted by Titanoboa would most likely have induced a brain hemorrhage in its victims. David Penning I've checked it several times. If Titanoboa squeezed with the pressures that we predict, I don't think there's any animal on the planet that would survive something like that. It's absolutely incredible. At the University of Chicago, Alex Hastings finally has the details he needs to estimate the size and age of the crocodile fossil. The first surprise is that the bone was not from the lower back near the tail, but is near the neck. But was it a fully grown adult or a developing juvenile? Virginia Museum of Natural History	The CT scans were amazing; the level of detail is unbelievable. You kind of see a little more of a spongy kind of texture in juvenile bones that err you see a much more solid firm texture in the adults. This is another kind of indicator that the fossil from Cerrejón is likely an adult individual. The Cerrejón crocodile was a young adult but more importantly, it was of a size to match the croc from the dinosaur era, Sarcosuchus. Alex Hastings The Cerrejón croc came out to be about 8.63 meters which is about 28 feet – that is an enormous croc, it's bigger than any crocodile that we have alive today. This behemoth of the swamps was almost 30 feet long, three feet high and weighed three tons – proof at last that the giant crocodilians did survive the catastrophe that wiped out the dinosaurs. These two colossal reptiles achieved a scale not seen since the days of the dinosaur. Now that we know how large the croc was, Dr. Greg Erickson can finally estimate the power of its monstrous bite. It is of a magnitude equal to that of a T. rex. Gregory Erickson Well we're talking about a 15,000-pound bite force, we're talking about twice what any living crocodile could do. To demonstrate this crushing power, they will use the skull of an adult cow, to see how it might fare in an attack. Gregory Erickson (SOT) Yeah pretty science-y. Gregory Erickson I suspect that a crocodile that could generate 15,000 pounds of bite force could pretty much crush just about any animal it got a hold of. We've got a cattle skull here and we're gonna take a mechanical loading frame, this is a device that engineers use to test the strength of structures and materials. We'll also be taking the data and we'll get a force displacement curve and from that we can see when the structure started failing. Gregory Erickson	(SOT) Yeah, it's still hitting, it's hitting on this side. You gotta watch it tilting. They're going to exert 15,000 pounds of pressure on this cow skull, second only to an elephant's skull in strength. Gregory Erickson	So we're ready to conduct our test, we'll see what happens! (laughs) You ready Bob? Greg Erickson	(SOT) OK, let's go and hit it. (SOT) Oh my gosh! Wow! (laughs) Just blew it up. Amazing. Wow. How much force? The skull is obliterated when just a fraction of the ancient croc's ferocious power is applied. Gregory Erickson I feel like I'm crawling through the wreckage here (laughs). So that was a demonstration of just 3,000 pounds of force, so (laughs) imagine five times that. I mean, this thing was one of the ultimate killing machines. Gregory Erickson (SOT) Oh my gosh! Wow! We now know the croc's bite force was of a magnitude not seen since the age of dinosaurs. Gregory Erickson I don't think any animal in this… in this creature's realm was safe. I mean this is a dangerous creature. Gregory Erickson	(SOT) Oh my goodness. Bob (scientist)	(SOT) Yeah, that definitely broke that thing. By studying the attack capabilities of the smaller descendants of these prehistoric giants, we have been able to piece together the incredible powers of these fearsome predators. Juveniles would always be vulnerable to other species, but when two adults went head-to-head, which would become apex predator? University of Chicago	It's a question of, who's gonna have the upper hand, would the snake be able to coil around, and/or engulf the crocodile, before it would have a chance? With a stranglehold more crushing than the weight of several military tanks, Titanoboa's size alone might have given it the advantage. Jason Head There's not a single animal that could have survived being constricted by those coils. But if the crocodile struck first, a bite force of 15,000 pounds per square inch would be more than enough to kill anything. Paul Sereno If you are in the territory of battle of a crocodilian, you don't stand a chance. In the end, it isn't how the creatures kill that settles the debate… it's how they eat. Museum of Zoology, University of Cambridge	Snakes can't actually purchase prey with arms and they don't chew – they don't rip their prey apart and chew pieces of it – they're basically walking their body over the prey. So his lower jaws can swing out and there's a big mass of soft tissue that can actually expand and create a massive gape. So for a Titanoboa with a skull, say, about this big, a gape would have exceeded two meters in total size, big enough to swallow any of the other vertebrates we find in Cerrejón. This ability allows this 12-foot Florida python to consume prey that would have been too large for other predators. But there are limits to what it could digest. David Penning The question becomes, could it have fit it in its stomach? And from the data that we have today, the largest prey that something like Titanoboa would have been taking was 60 percent of its own body mass. Would the Cerrejón croc's size have ruptured the snake's belly? It's this detail that decides the outcome. For despite Titanoboa's larger size, the adult croc was too big for the snake. Crocodiles, however, do not need to swallow their prey whole – they rip it into pieces. In the six years since its fossil was discovered, scientists thought Titanoboa dominated this little known era exclusively. But this land of giants has a new ruler: a crocodile with the size and force to outrank its rival. Cerrejón has a new apex predator. Jason Head To find something that amazing that both tells us so much about the natural world, it is a constant reminder to me of just what we don't know about the planet. Jonathan Bloch Who knows what's still to be found in these different types of environment? I think we're right at the beginning of understanding. Which giant animal was the apex predator 58 million years ago? 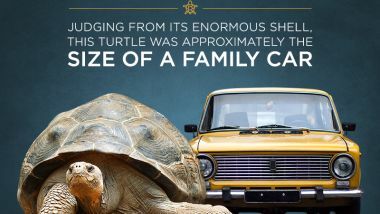 Infographic: A turtle the size of a car?